One of our customers, Compass RA, recently requested that we develop some products for them using coffee flour. This was a completely new ingredient to me but after a little bit of Googling I became very excited about the possibilities of using this wonderful product and with the team here at Paul Rhodes Bakery we have relished taking up the challenge. Coffee flour is derived from the discarded fruit husk – or ‘cherry’ around the valuable coffee bean. In so many of the world’s coffee growing regions this fruit has just been left to rot, or is dumped in a nearby river: very occasionally it is used as a fertiliser. Now it is being transformed, via drying and milling, into a rich flour which is not only creating sustainable jobs and a new revenue source for some of the poorer parts of the world, but it is also removing biological waste from soil and water. As well as the sustainability and economic benefits, coffee flour actually brings with it a huge range of nutritional benefits too. It is gluten-free, has more fibre per gramme than whole grain wheat flour and it’s also low-fat, iron, potassium and protein rich and is really high in antioxidants. So, potentially it’s a brilliant product. I am proud to say that we have recently delivered our first burger buns and chocolate brownies using coffee flour as an ingredient and that we have a number of other products incorporating coffee flour under development – both sweet and bread products from across our range. We are really excited to be in at the beginning of the coffee flour phenomenon and as far as we are aware, we are the first major British bakery to be using it. We are also delighted to have such a progressive client as Compass RA. Their commitment to supplying a range of enhanced Fair Trade and nutritionally beneficial products to their own customers has helped us deliver the aforementioned burger buns and brownies, while experimenting with a range of other products. Coffee flour does not taste – or smell – of coffee – it’s actually relatively tasteless. It is also quite dark, so can make some products look browner than usual – but it is incredibly versatile. That said, it’s not something that can just be used as a straight replacement for other flours. And that’s what we are currently experimenting with now. Coffee flour has to be mixed with other flours, at relatively low proportions, and incorporated into existing recipes. However, some products can take a higher proportion than others. Certainly in our experience sweeter products such as muffins can easily use more. It’s a bit different with bread due to the reactions with yeast but we are working on ways to maintain great tastes and textures with as much of this nutritionally beneficial flour as possible. I’m not a lover of gimmicks and crazes. I like to create great quality, honest products made from the best ingredients, all using traditional, handcrafted methods. That’s why I’m a big supporter of coffee flour: it truly is a great ingredient with lots of benefits. I think the market for coffee flour will definitely grow and develop over time and we’ll find it more readily available in the UK, which will be great. Currently we are importing from within Europe. In the meantime I’m going to keep on experimenting and finding new ways to incorporate coffee flour, in order to create a great range based around this ingredient. So watch this space! 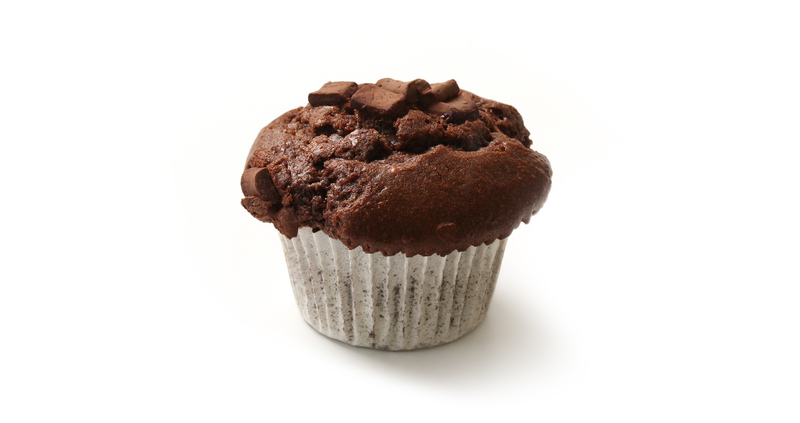 If you’d like to consider using it yourself, try my recipe for chocolate muffins below. A 500g pack of coffee flour can be readily obtained from Amazon in the UK. Combine both flours, caster sugar, 100g chocolate chips, cocoa powder and bicarbonate of soda in a large bowl. Whisk egg, yoghurt, milk and vegetable oil in another bowl until smooth; pour into chocolate mixture and stir until mixture is just blended. Fill paper muffin cases 3/4 full and sprinkle with remaining chocolate chips.